Keyword intent represents the user’s purpose for the search. It’s what the user is likely to do when searching for a particular phrase. Or, to be more precise, it’s what we think the user is likely to do since we cannot always be sure. 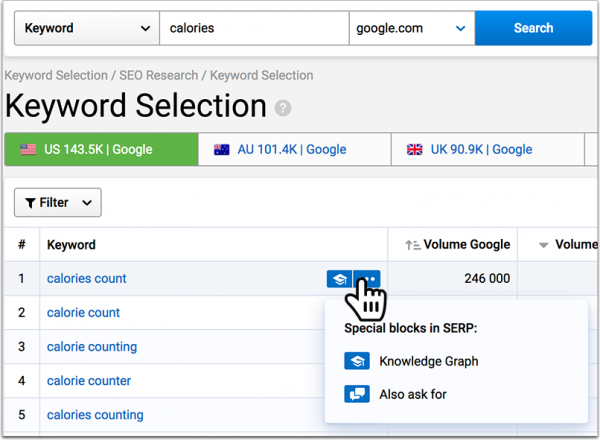 Keyword intent is undoubtedly the most important concept when it comes to keyword research. It helps you meet the users’ needs better and match your content and landing pages to their intentions. 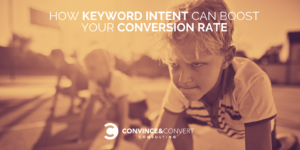 Analyzing keywords by intent is thus your first step when diagnosing conversion issues when it comes to search referrals. Let’s quickly see what each of these means. People are most likely to commit to purchase as a result of these types of searches. Best way to . . .
Anatomy of . . .
. . . vs . . .
Top 10 . . .
Keywords that contain brand names signal navigational intent, meaning a searcher knows exactly where they’re headed. 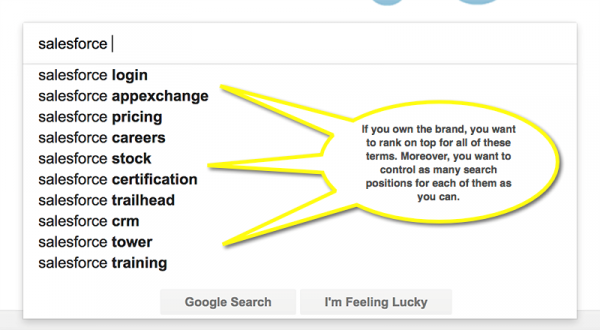 Brand name searches are your assets. If a person types in your brand name when searching, they already know exactly what they want; you just need to give that to them. Those searchers will land on your site, so your assets rank in top three for those queries. Pay close attention to search queries that contain your brand name, and monitor your site rankings for all of them. In most cases, you’ll be able to use your common sense when determining the search query intent. In many cases, it’s pretty obvious whether a user intends to buy, research, or navigate to a particular website. “Quick-answer” search boxes (those giving you a short answer on top of search results) signal information intent. “People Also Ask” boxes also signal informational intent. Google’s shopping results signal “high-intent” search queries. Google’s local results and knowledge graph tend to signal navigational queries. So does the “Search in Search” feature. This is a very useful trick when you are working on a specific marketing strategy. For example, when creating an editorial calendar, you can use Serpstat to research keywords triggering “People also ask” results, revealing obvious informational intent. Keywords with informational intent are straightforward content ideas to send to your content development team. Keywords with transactional intent, which could include content ideas (product lists, product comparison, product FAQ, product manuals, etc.) that smoothly walk the reader down the conversion channel. Keywords with commercial intent: If you have a product to match, refer to your SEO team to figure out how to better optimize product pages for them to rank for these queries. Alternatively, these can be product bundles (product lists) or other types of “buy now” landing pages that could match the exact high intent query. 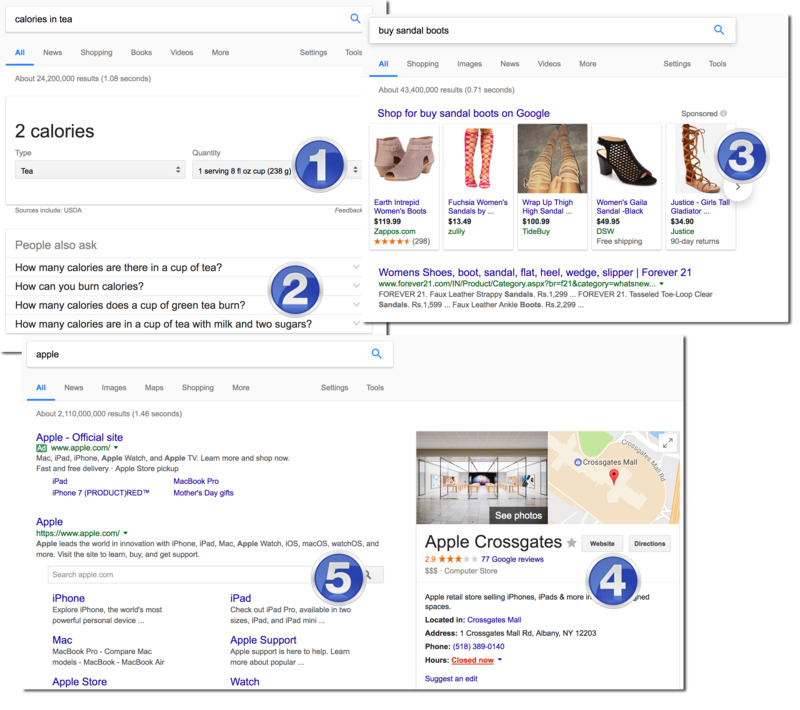 Keywords with navigational intent may be further organized by intent: Some of these queries will have “buy now” intent, while others may signal transactional intent (e.g. potential customers researching your product reviews). Some of these should be sent to your reputation management team, while some of these will help your sales or customer teams to better meet your clients’ expectations. Most of these queries will be useful for more than one team. Some keywords may be good ideas for new content or new landing pages. Some keywords may be used to optimize or update old pages. 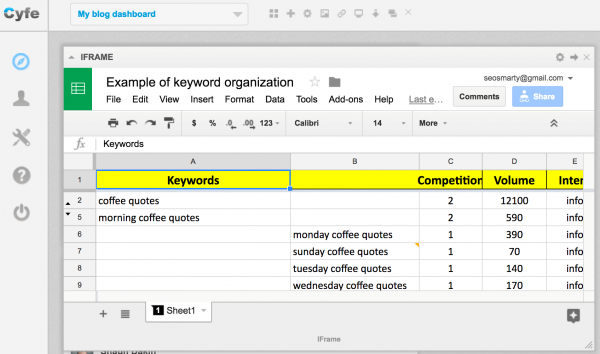 You can use Excel or Google Spreadsheets to organize your keywords using multiple labels. You can go through your keyword lists and organize them by intent, required action, and the type of the landing page you plan to create. View and copy this template here. You can then integrate those spreadsheets into a marketing dashboard or project management platform like Cyfe or Trello (or any of these other options) for easier sharing. Working with keywords takes time, but it defines your future marketing strategy on many levels, so don’t rush things up! Targeting user intent when planning and optimizing your content makes your whole digital strategy much better organized and more conversion-oriented. With the above analysis, suddenly each of your web pages has a purpose.